Hearing that you have diabetes is stressful. The thought of injecting insulin and radically altering your diet can be overwhelming. Thankfully, the good news is that you can still have an excellent quality of life. Small changes add up to good health over time, and with so many good food and exercise options, you can be an active participant in controlling your disease. However, one question remains – can you still get life insurance for diabetes? The answer is yes. Read on to find out how. No medical life insurance is specifically designed for people that cannot get traditional insurance. This is usually due to pre-existing health conditions, but other people (such as those needing short term life insurance plans to cover gaps in employer-sponsored benefits or those that simply do not like having medical exams) can take advantage of no medical insurance too. Take a look at the overview below. 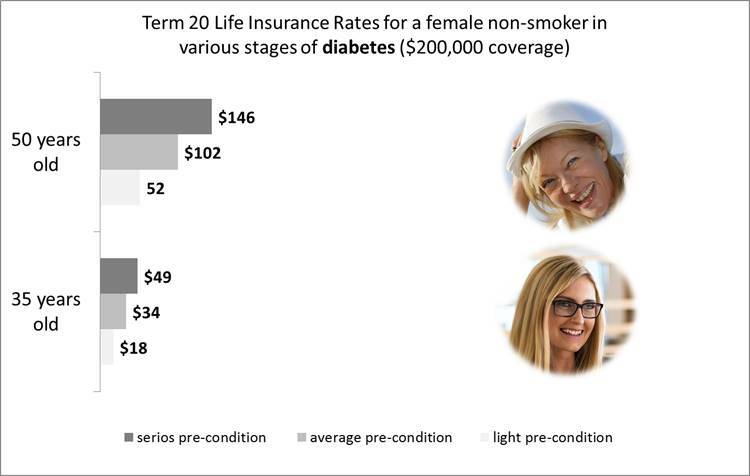 This one shows typical Term 20 life insurance rates (coverage of $200,000) for non-smoking diabetic men and women. Note, however, that these rates will vary depending on the severity of your condition and the steps you are taking to improve your health. We can help you to get life insurance for diabetes. 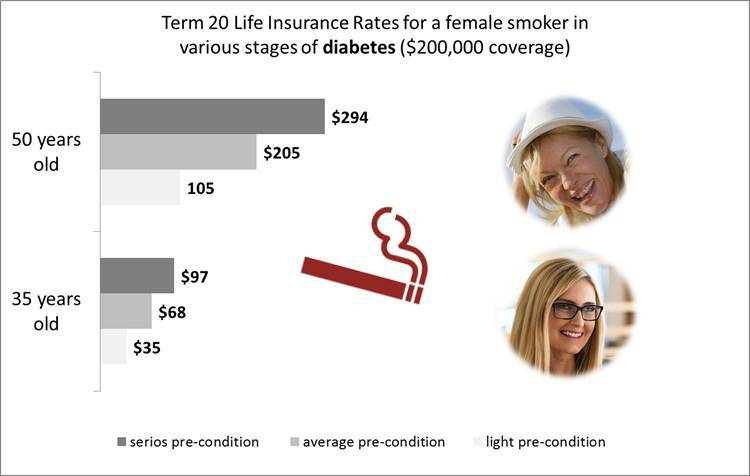 Read on to find out how to get life insurance for diabetics if you are a smoker. Diabetic smokers put themselves at tremendous risk. Their risk of heart disease, kidney failure, poor circulation, vision problems and nerve damage is much higher than those of their non-smoking counterparts. Do everything you can to quit. Not only will quitting help to increase your life span, you’ll get lower insurance premiums as well. 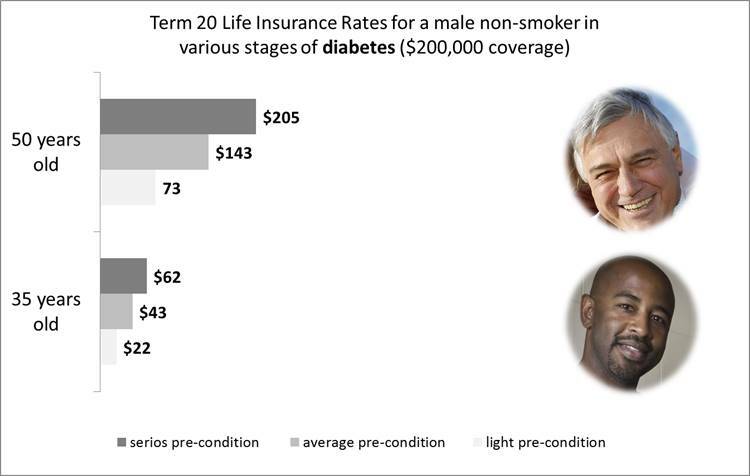 Review these points below to see how much more diabetic smokers pay per month (based on a Term 20 policy with $200,000 in coverage). While you can still qualify for insurance, the increase in the premium reflects the increased risk you represent to insurers. 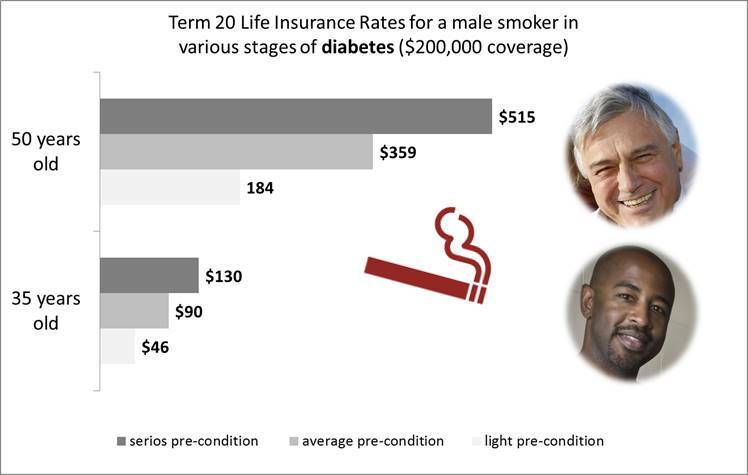 An experienced broker can help you get life insurance for people with diabetes, even if you are a smoker. Age: Usually rates rise as you age, but when you have diabetes, an advanced age shows that you have the disease under control. Blood sugar: If you can prove that your blood sugar is under control, you can be rewarded with a lower premium. Ask your doctor for a glycohemoglobin test and show your insurer the results. Insulin: Some diabetics control glucose levels through diet and exercise. If you don’t have to rely on insulin injections, you may get a better rate. Simplified or Guaranteed Issue Insurance: Both simplified and guaranteed issue life insurance policies are designed for those with pre-existing health conditions. By applying for one of these policies instead of a traditional policy, you greatly increase your chances of getting coverage at a good rate. We’ll talk more about simplified and guaranteed issue life insurance below. Pre-existing conditions are health conditions that one has before they apply for life insurance; for example, diabetes, heart attack or cancer (in or out of remission). While having such a condition makes it difficult to get insurance, it is not impossible. Depending on severity of you diabetes or other pre-condition, two types of policies are available. Guaranteed issue life insurance: You can never be denied for guaranteed issue, and there are no medical exams or questions. However, the premium is high and the coverage is limited to $25,000. It is worth it. This benefit can be used for treatments or final expenses, greatly easing the burden of sudden, high costs due to medical issues or death. Simplified issue life insurance: A short medical questionnaire – no exam – is all it takes to get you qualified for simplified issue. This is the go-to policy for most people with pre-existing conditions. The premiums are not as high as guaranteed issue, but they are higher than traditional policies. Coverage usually goes up to $300,000, which is, again, can be the difference between affording medical care and final expenses or experiencing financial ruin. An experienced life insurance broker will help you get a life insurance for diabetes case, that takes into account your age, health and prognosis. Since a broker does not work for one specific insurance company, they can shop the market for you to get you the best policy and premium for your unique needs. Best of all, it doesn’t cost you anything to use a broker! Brokers get commissions from the policies they sell, so you can get a tailored quote risk-free.